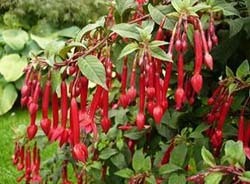 The fuchsias in this section are characterised by a long thin tube with short stiffly held sepals and a short corolla. 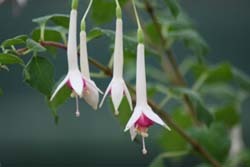 The flowers are strongly coloured with deeply coloured foliage to effect a startling contrast. 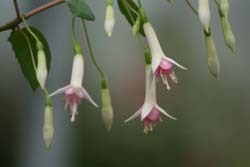 These varieties will require frost protection, but can take a more sunny position than other types of fuchsia during the summer months. Trailing habit. Tube and sepals white, corolla soft pink. Salmon orange self-colour with sage green foliage veined in a lighter shade. Tube and sepals bronzy orange, corolla brighter orange. Foliage bronze-green. Good self-branching growth. Vivid bright red self-colour, velvety long leaves dark green with reddish-purple veining and purple undersides. Tube and sepals white, corolla rose. 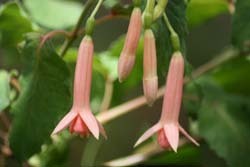 Delightful romatic pink blush blooms. 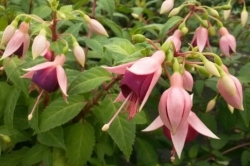 Dark burgundy self-colour, flowers held stiffly at the horizontal, small bronze leaves. Tube and sepals poppy red, corolla indian orange, foliage olive green with heavy veining. Orange scarlet self-colour, velvety dark reddish-green foliage with purple undersides.